OSWEGO, NY – For five years, Compass Credit Union fielded a team at the annual Oswego County Opportunities Literacy Volunteers Scrabble Fest, an annual charity event that promoted and supported literacy in Oswego County. When Scrabble Fest ended in 2016, Compass manager, Tom O’Toole, proposed that Compass take on this important charitable endeavor. 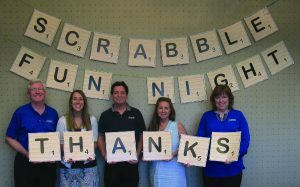 In early 2018, a small committee comprised of former Scrabble Fest volunteers and participants began planning a 2018 Compass Credit Union Scrabble Fun Night. Sixteen teams and numerous volunteers came together at Oswego Elks Lodge 271 to keep the support for literacy alive in Oswego County. They played Scrabble, aided by Scrabble Power Plays such as Ask the Expert, Steal the Dictionary, and Stop and Swap. They filled in the time between rounds of Scrabble to play Scrabble Bingo, have their photos taken in costume at the Scrabble Wall, and try their chance at raffles of gifts contributed by various donors. The night was filled with joy, laughter and many winners. Almost everyone who played Scrabble Bingo was a winner with more than 20 prizes being awarded. First place winners of the two Scrabble divisions were Nelson Law Firm at the Novice level and “The Cleverest Team” at the Intermediate level. The organizations that benefited from the event are The Reading League, the Oswego County Literacy Volunteers and the Oswego Community Christian School Library. The greatest winner of the night was literacy. Funds were raised from entry fees, Scrabble Power Plays, Scrabble Bingo, raffles, donations of food and prizes along with the following financial sponsors. Particular thanks goes to the $1,000 sponsors, Compass Credit Union, Empower Federal Credit Union and Exelon; the $250 sponsors are Novelis, Owner’s Choice Funding, Hillside Park Real Estate and Money Federal Credit Union; and the $100 sponsors Canale Insurance and Accounting and the Oswego Elks Lodge. The vision of continuing to promote and support literacy in Oswego County is alive and well. Be prepared to join us for the next Scrabble Fun Night, which is planned for September 27, 2019.